Let’s face it, owning a stair lift can be very helpful. Its invention has done a lot to improve the quality of life of people who are disabled, aged, recovering from surgery or those who are very prone to falling down if unsupported. Many homes today have more than one floor and getting around it is often a challenge for people who can’t walk properly for one reason or the other. They either have to get someone to assist them when going upstairs or completely avoid the staircase altogether. 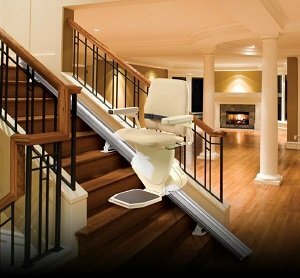 This is why a stair lift might be needed in your home. Now, you’ve probably asked yourself this question: What is the best stair lift available today? Well, this is why we wrote this guide. In this article, we will be discussing stair lifts in detail, we will tell you our current top 5 picks and why we have chosen them. We will discuss their unique features, pros, cons, what customers think about them and how affordable they are. So, without further delay, let’s go straight to list our favorites. Now that we have listed our top 5, why don’t we go into specific details of each of them and tell you the reasons why each one is preferred. Hopefully, the details will help you select one that is perfect for you easily. Note: The rails of all of these products have to be custom-crafted to your staircase, the companies will usually ask you to submit the dimensions of your staircase while your order is being placed. They also help to direct you if you wish to install it yourself or can link you with an installation company near you. This is definitely the top-of-the-range product. It has so many features that easily make it stand out from others. From its looks to its easy maintenance and even its functionality, this is a top-notch product. It takes relatively less space than other chairlifts when installed. If you have a narrow stairway, you’ll want to get a stair lift that won’t take up all the space available and make the stairway look choked up. Also, those who can climb the staircase won’t have to watch out for the chairlift, it simply blends in. It is foldable and occupies only 10.5 inches when folded up. Also, unlike some other similar products, it is made to be installed on the actual steps rather than on the wall. This product does not operate by rack and pinion, instead, it uses a motor and a circuit board, which is somewhat the more modern and convenient operational model. Rack and pinion chair lifts need to be routinely greased to help them function effectively. This is not the case with this item. So, you won’t have to worry about getting your floor and carpets stained with grease and oils. How then is this chairlift powered? Well, it uses a rechargeable battery during its upward and downward glides. At either end, it can be connected to an electric socket, which charges the battery when the chair isn’t in use. Furthermore, the makers of this stair lift attached a lifetime warranty to the product. This should tell you how durable and long lasting it is. So, it’s basically a one-time investment to make your home more comfortable, you wouldn’t be needing to change it for a very long time. Well, we think that even though this item has a lot of quality and is more durable than others, it is a bit expensive. Not many people may be willing to spend quite much on a chairlift. But if cost isn’t all that important to you, you should definitely get it. So, that wraps up our review of this chair. Next, let’s consider what actual customers thought about this item. There was a concern about this chair being used to carry laundry, which was properly addressed by the company’s representative. The chair has flip-up arms, so you can simply attach a clothing basket or bag and send upstairs. There may be no need to carry stuff upstairs anymore. There was also praise for the retailer’s customer service. Even though you may need professional help in installing the product, the company provides significant support if you choose to do it yourself (we honestly don’t advise that you do it yourself). Now, unto its pros and cons. This is also a very good lift for stairs, and apart from its cool features, one thing that makes it stand out is its price. Its cost is about half the price of many chairlifts in its category. Now, the awesome thing is that its makers didn’t compromise standards or quality when crafting this product. So, basically, you get almost all the qualities you need at half the regular price. It is quite comfortable, with a backrest, armrest, and footrest, your glide up and down the stairs should be a pleasant experience. It can handle steep staircases, gliding you through without you being afraid of falling off. The manufacturers say it can actually still be used on staircases that incline up to 55 degrees, which is pretty outstanding. Also, if your weight is a bit on the high side, it is still a good fit for you, it can handle up to 300 pounds of weight without any problems. It gets its power from a rechargeable battery. It uses this battery power in its movements across the staircase and is recharged when at rest at either side of the stairway. The battery lasts up to a few years (pretty good). About its downsides, it occupies a fairly large amount of space when folded up. So, depending on the width of your stairway, it may not be the most convenient. The chairlift takes up about 13.5 inches from your space, which might just be significant enough to bother you. Also, the product comes with about 14.75 feet of tracks, with may be a bit short, and if you have a lengthy stairway, you’ll have to spend extra money purchasing additional rail for your chairlift. The makers also don’t expressly state that the item comes with any warranty. So, if you run into any technical problems with your chair, you’ll have to spend some more money sorting it out and getting it fixed. The assessment of this product was positive. It was reportedly easy to install and use. This tallies with our own assessment of it having all the basics you need in at a low cost. What makes this particular product stand out is that it is completely AC powered- it doesn’t have or need a battery to function. So, unlike many other lifts, you’ll not need to bother about a progressively weakening battery or purchasing a charger or so much maintenance. It gets its power directly from the electric sockets in your house. Some people prefer this method of operation, so if you have this preference, you don’t have much to think about, just go for this lift. Another feature that is different from the average stairlift is the location of its track- it is mounted on the steps of your staircase rather than on the wall or railing. The seat and footrest are also comfortable and fold up when not in use, to decrease the amount of space it takes. The makers also took time to create a comfortable experience when using the chair. The backrest has different settings, the footrest is adjustable for different heights, and the seat itself is padded and wide, being able to handle up to 350 pounds of weight. The upholstery also comes in several colors, so you can select a color that matches well with the theme of your home. The stairlift is durable too, the company also offers a lifetime warranty on the drive-train and the motor, which are the main functional parts of the product. It really provides good value for money. What don’t we like about this stairlift? Well, it takes a little bit of space when installed, it isn’t the most unnoticeable device out there when by your staircase. The vibe we get from what others had to say about this device was very positive. The Medallion stairlift is a very rugged and durable product. It also features a no-grease design, so your home can be clean and dry, and can be maintained by gently cleaning it with a soft cloth. It has a circuit board and motor that moves the chair up and down the stairway. It is a device that is built from solid materials that are made to stand the test of time. So, if you have just moved into a new home and need a chair lift for your staircase that will serve you for a very long time, you should pick this one. Also, it is quite economical. For its price, which is fairly cheap, the product’s track can serve up to 19 steps, this is quite long, compared to some other products that offer a few feet of tracks, requiring a premium fee to add extra track length for you. So, if you have a very long and straight staircase, this is also a good fit for you. After your order is placed, the company will require details about the dimensions of your staircase, then cut tracks that suit yours. They also will link you to an installer, in case you can’t do it by yourself. To its downsides, it isn’t the most beautiful chair lift available today. Also, it still takes a significant amount of space when folded up on the stairway. So, it may disturb or obstruct your walking path a little bit, if you choose to climb up the stairs instead. So, what did users of this chairlift say? The general performance of this device was praised. It was also said to be relatively easy to install (although, we recommend you get a professional to handle the installation for you). There was no real negative report, and its durability was attested to. Below is our summary of this item for you. Sometimes, your need for a chair lift across a flight of stairs may not be inside your home but outside. Perhaps, the design of your apartment building requires you to climb some steps to get to the front door. This is why we have outdoor stairlifts, and unlike their indoor counterparts, they are adequately crafted to handle the elements. We chose this particular stair lift by Jameson because it has all the basic requirements of a good outdoor device. It has significant waterproofing and a covered gear system, making it ideal for different weather conditions. It operates based on a rack and pinion system, so you’ll need to remember to grease it from time to time, to avoid unnecessary equipment breakdown. When you are about to purchase this, please remember to send the accurate dimensions of your stairs, as these products are custom-made to fit your particular staircase, and you can’t return it once it’s been made for you. It can be installed on either side of the steps, with a smooth stop and start system in place. What this means is that you won’t be jerked or thrown off the chair when you start your glide or coming to a stop. Without this system in place, a forceful stop at either end of the stairway will probably throw you off balance, perhaps hurting you in the process. It is battery powered, and charges at either end of the stairs through an electric socket. It clearly uses rack and pinion, so it needs to be maintained regularly by adding grease to the chair. This may be quite messy and could make the environment stained with grease. Before deciding to spend some good money getting yourself an ideal stair lift for yourself or home-use, there are many factors to consider. If you’ve totally read all we’ve written so far, you’ll notice that there are certain features we mentioned that clearly make up a good stair lift. Let’s discuss them for emphasis. When buying a chair lift for your stairs, you need to look at how long it will last. You don’t want to spend a couple of thousands of dollars on a product that will last just a few months or a year. One simple way to know a product is durable is to look at the warranty period. After all, if anything goes wrong with the item, you can return it or its parts may be changed for you without any cost to you. So, some brands shy away from offering you any warranty period, while some durable ones show off the longevity of their chairs and motors by offering a lifetime warranty. If I were personally to choose, I’ll always look out for a long enough warranty, for one simple reason: these items aren’t the cheapest things to buy. You should always consider how the chairlift will look when it isn’t in use. You definitely want a chair that will not obstruct the path of people who prefer to walk up and down the staircase. Many products offer foldable seats, however, still take time to inspect how much space the foldable seats occupy. The Nautilus stairlift takes the least space- just 10.5 inches, unlike others that average 13.5 to 14.5 inches. The former is ideal for inside your home, as it uses an electric gliding system, and can be easily maintained without soiling your floors. On the other hand, the latter needs regular greasing, which can just make it clumsy and cause stained floors. So, you should avoid a rack and pinion stairlift, except it’s going to be used outside your home. Lastly, you need to be sure you’re not overspending to get yourself one. I don’t mean you should take the cheapest, but you need to look at what value each one will be giving you at a particular cost, and what you actually need. For example, if you just want something basic that isn’t necessarily going to be used on a daily basis, you don’t need to spend over $3000. However, if you want the more sophisticated ones that offer a lifetime warranty, that can be used every day for years, then, look at the cost as an almost one-time investment in your comfort. So, this concludes our review of the best chair lifts for stairs available today. However, we want to hear from you too. Have you used any of these listed products before? What is your opinion about them? Also, is there another chair you’ve used that you think deserves to be added to this guide? Please, let us know in the comments, we are open to adding or removing from this list, based on your suggestions. Thank you for taking out time to read this.